Industrial Jobs Coalition Fact Sheet: Why does the proposed self-storage special permit matter? The City recently certified a land-use proposal to limit self-storage development in core industrial areas. 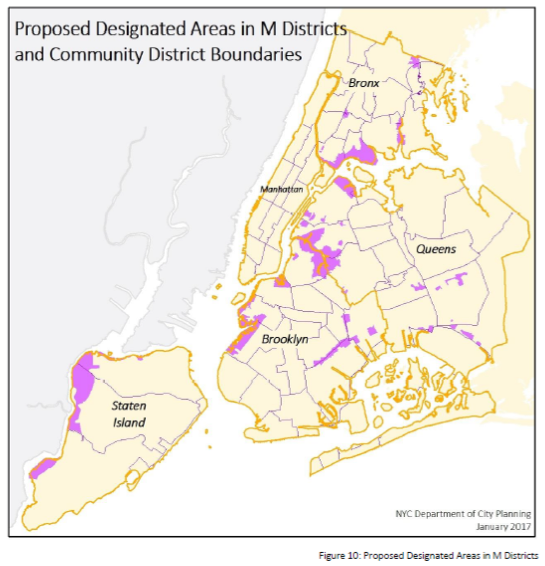 This step forward is a significant victory for City Council members and community groups that care about a progressive industrial policy that promotes quality jobs and equitable economic development. But the self-storage industry association is pushing back, and we have to make sure that we keep the momentum to win this important step forward. Industrial and manufacturing jobs are good paying jobs. The industrial and manufacturing sector has historically played a key role in creating a robust working middle class. While the sector has changed since its peak in the middle of the 20th century, wages remain strong. Average wages in the industrial sector are over $50,000 a year, significantly more than average wages in retail or food service. In a city where affordability is a constant challenge, retaining the kinds of jobs that allow people to stay in the city is crucial to an equitable economic development strategy. The majority of industrial and manufacturing workers are immigrants and people of color. [caption id="attachment_10679" align="alignright" width="300"] Nearly 1 in 7 Hispanic New Yorkers who work have jobs in the industrial sector. [/caption] In terms of who receives these wages, the demographic breakdown of the sector presents a diversity that mirrors New York City as a whole. 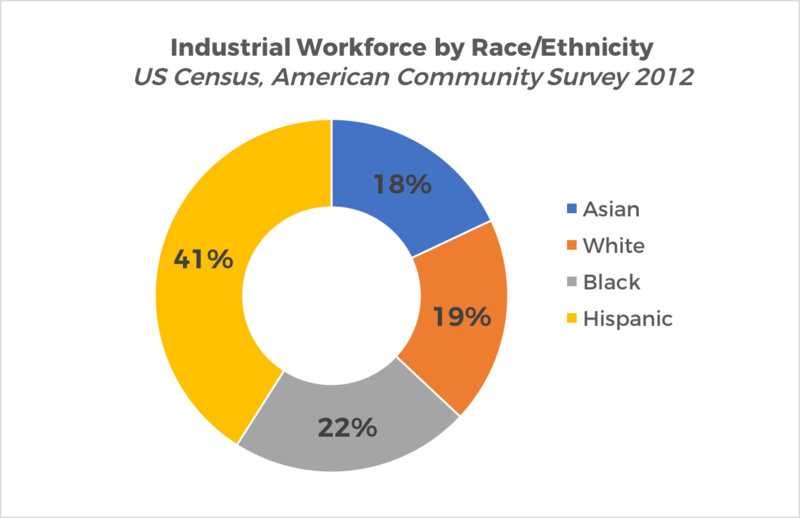 With a majority of workers foreign-born and over 80% of workers being people of color, the industrial and manufacturing sector provides access to good paying jobs while often not requiring a college degree. 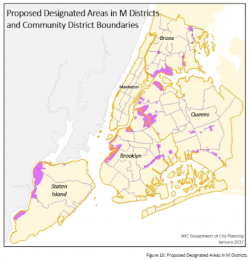 The proposed special permit begins tackling the broader displacement of good paying jobs from NYC. A major challenge to the sector has been the commercialization of industrial-zoned land. The Council’s Engines of Opportunity report recognized the “continued pattern of speculation and warehousing…and lack of suitable zoning.” The overly broad use groups have allowed competing uses to displace industrial businesses and workers, leading to a loss of jobs. The Administration’s Industrial Action Plan aimed to address this challenge by limiting self-storage and hotel uses via a special permit. There is considerable space available for self-storage. 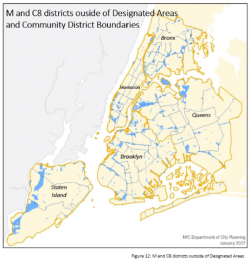 The proposed special permit for self-storage only applies in “designated M-districts,” areas which largely overlap with the City’s existing core manufacturing areas – the Industrial Business Zones – as shown in the map on the left. 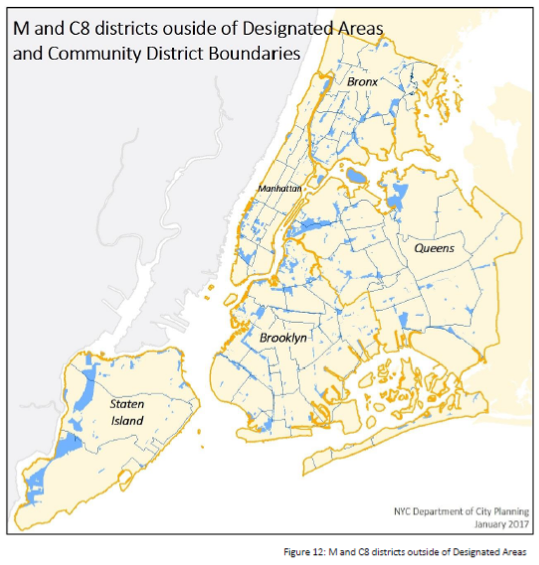 In other words, new self-storage storage facilities will still be permitted as-of-right in C8 and M zones outside of the “designated M-districts”, as shown in the map on the right. Additionally—while the self-storage industry’s model is still rapidly evolving in terms of space needs—industrial and manufacturing businesses, supporting local supply networks, locate and operate in the city as a matter of necessity. When space is preserved for manufacturing, those jobs stay in the city. If manufacturers are less concerned about being priced out of their neighborhood, they are able to focus their attention back into running their business, whether through investing in new equipment or scaling up and hiring more employees. Manufacturers have been pushed out of the city due to rising real estate prices, but there has been continuous demand for affordable industrial and manufacturing space. The City has recognized this challenge, launching the non-profit Industrial Development Fund to address this gap and keep more jobs in the city. Click here to download the Industrial Jobs Coalition Fact Sheet. A vibrant industrial sector is essential to the City's efforts to build a more inclusive, equitable economy. The industrial sector is a critical source of well-paying jobs with low barriers to entry and offers opportunities for entrepreneurs to launch new businesses. For the City to have a successful economic equity policy, it must have a vibrant industrial sector. The Industrial Jobs Coalition (IJC) was formed to increase awareness, advance implementation of these strategies, and elevate the dialogue between city agencies and the industrial community. Click here to read more about the coalition.